If you shop at Waitrose you can nominate Epilepsy Research UK as your chosen local charity by completing the nomination form found at the Customer Services desk in store. 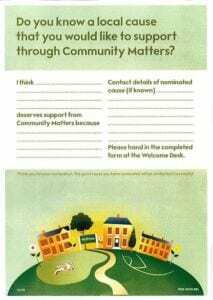 Three good causes receive a share of £1,000 every month from the Waitrose Community Matters initiative. The charities and community groups are selected by nominations from customer and Waitrose employees, so please be sure to nominate ERUK in your local store! Customers shopping in the store are given a green token in which they can vote for which of that month’s three charities they want to receive the donation by placing the token in one of three Perspex tubes. At the end of the month the cash is divided up in proportion to the number of tokens a charity has received. To nominate ERUK just pick up a leaflet in the store from the customer services desk, and complete the details and then hand back to the customer service desk. The form is very brief, and will take just a couple of minutes to complete.